Throughout 2018, I will be doing a monthly blog on my journey back from a major setback. The Fast Running class of 2018 follows the insights of 10 different athletes. They vary from 100m sprints, middle distance speedsters, one of the world's best beer milers and an international ultra runner. Check out the Fast Running class of 2018 profiles and have a read of mine here. All athletes will have £100 donated to their chosen charity. Readers will have the opportunity to vote for their favourite athlete at the end of the year and the winner will have a £500 donation. My chosen charity is the British Lung Foundation who do fantastic work with people with lung conditions in the UK. My first blog will be out towards the end of this week - I'm pretty nervous about this one, but I hope it provides an interesting insight and sets the scene for the next 12 months. Goals are not only specifically about racing and for some runners, it’s about staying injury free or finding consistency in their training once again. New Year goals? 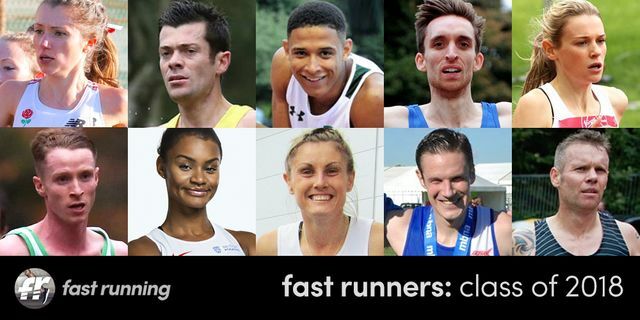 Fast Running is excited to launch a new year-long feature with 10 runners in the spotlight - from sprinters to ultrarunners - as they try an attain their targets in 2018. 'fast runners: class of 2018' Next up is Laura Riches, a steeplechaser at heart but has also represented Great Britain on the mountains – add in the Beer Mile and it’s a fascinating mix.